Connect your Apple multimedia device to two accessories at the same time! 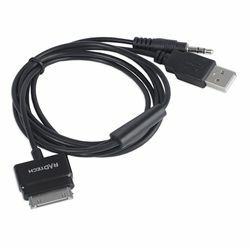 The USB connection can be used to sync or charge your iPod or iPhone®, while the audio mini-jack can be used to send line-level audio to a stereo system in your car or at home. Combined with an automotive USB charger (sold separately), you can use this cable to recharge your device and play music at the same time! Use with Lightning connector iOS devices (iPhone 5, iPod touch 5G, iPad mini, etc.) requires adapter.